A beautiful sunrise begins to fill the Murfree Spring wetland with a brilliant orange glow. The sounds of birds, ducks and even frogs breaks the silence of the long quiet night. For those who are fortunate enough to have experienced this, it is hard to conceive that thousands of people are rushing through life just beyond the heavy barrier of trees that seems to muffle the noise of the world. This peaceful country setting is just a stones throw from the busiest intersection in the entire state of Tennessee. Since 1946, this natural retreat has also been the home of Rutherford County’s first radio station. It all began at 10:00 o'clock on the night of December 31, 1946. Rutherford County’s first radio station signed-on to ring-in the New Year of 1947. Over the decades that followed, a sleepy country town of a few thousand persons grew into a bustling city. 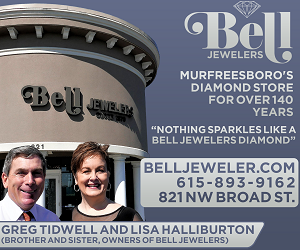 In fact, Murfreesboro's population is now well over 100,000, and is one of the nation’s fastest growing cities. Rutherford County has over a quarter-million residents! The stories of those changing times were told daily over this truly local radio station. That never ending story continues to unfold today over the Good Neighbor Station's airwaves (note: the GNS in the callsign stands for Good Neighbor Station). If someone could only invent a radio that could capture the stories that have been broadcast over-the-years through that tower of steel. However, there is a unique difference now. Thousands of visitors each year are able to experience the serenity of Murfree Spring. A boardwalk system takes them through a beautiful wetland area with historical markers created by the Murfreesboro Parks and Recreation Department. And yes, in the center of it all is a new 328-foot WGNS radio tower. It was the hard work of community leaders that allowed the community’s Good Neighbor Station to rebuild on its original site. And as the late Paul Harvey said so many times over WGNS, "And now the rest of the story…"
The 3-months that followed forever changed the Good Neighbor Station, and make this broadcast service even more thought of by the public as being our radio station. The tragic Easter Sunday morning storm created what might be compared to a modern day community barn raising. It has been said that "true wealth is measured in the number of friends who stand by you when trouble strikes". With that in mind, not only is WGNS Talk Radio truly blessed–it is "immensely wealthy". We are wealthy with community support and friendship. Here is that story . . . The Road To Recovery had many twists, turns and surprises! WGNS (AM 1450) was back on the air within 18-hours using a temporary antenna. A 330-foot wire was strung between two Murfreesboro Electric utility poles alongside the levee driveway leading to the old tower. 2. As well as a waiver of "land use"
The first 45-days were filled with getting earth core drillings completed and placing the data onto city codes’ forms. There always seemed to be another form to complete and another inspection before the next phase could begin. In looking back, this gave much needed time to analyze each step and make the new tower even stronger. During this period of time, the community listened to 1450 daily and heard about the progress. It cemented the bond even more between WGNS and listeners. WGNS truly became their radio station! Bart would tell listeners how work with the City of Murfreesboro, Federal Communications Commission and Federal Aviation Administration was proceeding. 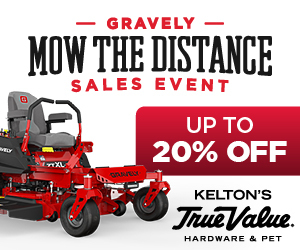 When there were bumps in the road, the Good Neighbor family knew about them. On Friday, May 18, 2001, WGNS appeared before the Murfreesboro Board of Zoning Appeals (BZA). Bart watched in awe as over a hundred citizens packed the City Council Chambers. At that time, it was not known whether this crowd was there to speak "for" or "against" rebuilding the radio tower. Bart remembered, "As I walked into the city council chambers, I had no idea who or how many people would be for or against WGNS rebuilding its tower. I was surprised to find a full room of people." Walker noted, "As the meeting progressed, I was emotionally moved to hear the testimonials in support of WGNS. Words can not express how much YOUR support has meant during this trying time." YOU are truly the Good Neighbors! A special thank you to the Children’s Discovery House board, Murfreesboro Police Department, Rutherford County Sheriffs Office, Rutherford Emergency Management and the Heart of Tennessee Chapter of the Red Cross for filing written requests with the city asking them to approve WGNS being returned to "full coverage" with a 328-foot tower. I want to publicly express my sincere appreciation to the following persons who took their time to speak on behalf of WGNS before the Board of Zoning Appeals on Friday, May 18, 2001: (listed in order of their presentation to the BZA) Myrtle Glanton Lord, Dr. Al Moffett, Madeline Methvin (Red Cross), former Murfreesboro Mayor Joe B. Jackson, Murfreesboro Police Commissioner Bill Jones, Leamon Flatt (minister of Bellwood Church of Christ), Rutherford County Sheriff Truman Jones, State Representative John Hood, Doron Claiborne, Hampton Turner, Ray McClanahan, Tony Snook, George Gardner and Wayne Walls. 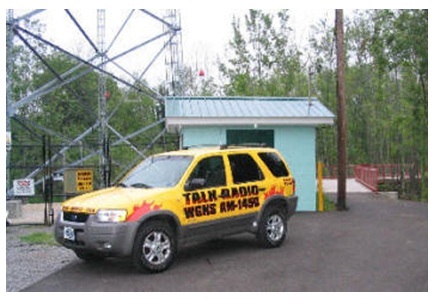 Only one person spoke against approving the request for a waiver to rebuild the WGNS' tower. When the requests were approved, everyone in the council chamber stood and applauded. That even included the one person who spoke against the request. He later told Bart, "The city never gave me a waiver, and I was against anyone else getting one." This restaurant superintendent started to leave and looked-back to say, "I'm glad you got the waiver." As required by law, the hearing was transmitted over the city’s cable access channel. At the end of the hearing, TV viewers overheard personal comments from BZA members. The somber silence was broken with thunderous applause from public citizens in the council chambers when approval was granted. Perhaps it was the excitement of the moment, but the BZA members began to applaud too. Thinking their microphones were turned-off, one board member turned to the BZA chairman sitting beside him and said, "Can you believe this, we’re applauding too." Chairman Bill Nelms chuckled and replied, "I’ll be able to clearly hear Braves baseball again." For a moment, let’s step back to around 7:30 Easter Sunday morning, April 15, 2001. As Bart drove past the Jackson Heights Shopping Center, he could clearly see the tower was gone. A few minutes later, he was at the site and standing before a pile of twisted steel. Once he gained composure, he called his longtime friend and mentor Bill Barry. Despite the fact that it was early on this special religious day, Barry dropped everything in Lebanon and rushed to Murfreesboro. Their friendship goes back to when Bill Barry gave Bart his first job in radio. That was some during the summer before Bart's freshman year in high school. 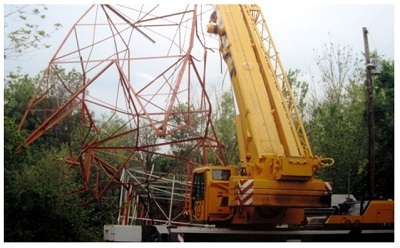 When told that a 300-ton crane was needed, someone suggested Elliott Crane Service. Instead of sending staff members, the firm’s owner Bud Elliott personally brought his crew to the tower site. 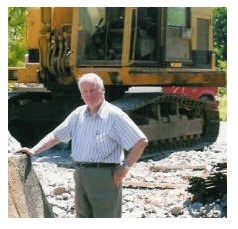 In fact, Mr. Elliott, who had several major construction projects over the Southeast, became so involved that he spent several hours daily giving guidance to his crew. Jim Coleman, owner of Birmingham based Southern Broadcast Services, was another person who made the rebuilding a success. Bill Barry, Charlie and Fred Farrer, Bud Elliott and Jim Coleman are the lifelines that helped WGNS through those tumultuous three-months. Jim Coleman (second from left with light green shirt) and his tower crew were true professionals. Jim is a broadcast engineer who knows the technical side of radio in addition to the skills needed for tower construction. 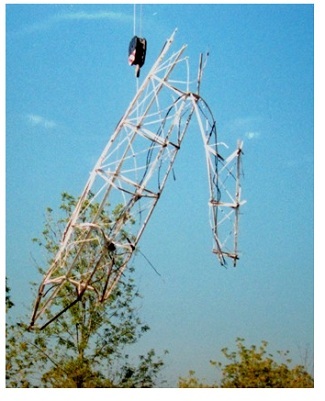 The WGNS' tower fell a few weeks before the annual National Association of Broadcasters' convention. Bart said, "I had not planned to attend the national convention in Las Vegas. However, it had every major tower firm represented. I had never built a tower before, and this was an opportunity to see which firms were comfortable to work with and learn about their product. I also learned about many tower crews. Jim Coleman's name kept coming up. I now know why. The Southern Broadcast Services’ crew was always helpful, courteous and hard working." WGNS is a true family business. Scott Walker (pictured here with blue shirt) was on-the-job almost every waking hour during the 3-month rebuilding period. He is Bart's son, and his help was and continues to be very much a part of the spirit that grows stronger daily at the Good Neighbor Station. Scott is now in charge of the day-to-day operations at WGNS…including sales, local news, television and internet services. To say "he makes a dad proud" would be putting it mildly. He never seemed to have an interest in broadcasting while in high school. However, it must have been sinking-in bit-by-bit without either of us knowing. Since Scott now has hands-on experience with the construction side of broadcasting, I think he is prepared to tackle unexpected challenges that life might dish-out. You never know when or if this will ever happen again, but the secret is to have a plan in place that will link you with trustworthy professionals who can guide you through the troubled waters. We had that guidance starting with city officials, local contractors, tower manufacturers and specialists in broadcast construction...plus, plenty of support from friends and listeners. That’s Bud Elliott wearing the black shirt (left photo). Bud's talents are used in major constuction sites around the nation, but he lives in Murfreesboro. Bud is another leader who took a personal interest in this project. In fact, Bud was a regular at the tower site. His wife would bring their baby to the swamp and bring Bud his lunch. 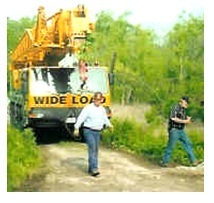 This is one of Bud’s smaller cranes coming down the levee-type driveway. It was used to lift the fallen tower out of the swamp. If you think that’s a big crane, you should have seen the 300-ton giant that lifted tower sections into place. The causeway that goes through the wetlands had to be re-enforced with large rock and then compacted before the heavy equipment for that phase of the construction began. I am grateful for friends like Bill Barry (left photo). He owns WAMB radio in Nashville, and gave Bart his first job in radio when he was 14 years old. Bill continues to be a friend and mentor. He was at his home in Lebanon when Bart phoned him early that Easter morning in 2001. He dropped everything and was at the WGNS' tower site within the hour. 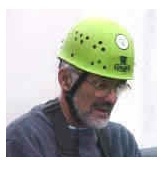 Bill Barry has much experience with building towers and gave guidance over the next several months. His knowledge assured that the new tower would offer improved signal as well as reduce the chances of such a disaster repeating itself. Bill Barry made visits to the Murfree Spring wetlands on a regular basis over the next 3-months, while issues were addressed through the city codes department, construction crews and engineering firms. Engineer Gary Brown (left photo) is another "Good Neighbor" For the 3-month period when PiROD was designing and manufacturing the new tower, Gary worked his "magic" to keep the station on-the-air and very close to full-power. A 300-foot long-wire antenna that was 30-feet in the air and alongside the levee type driveway kept WGNS on the air. Good Neighbors like them are the heroes who turned a nightmare into a period of celebration. It was encouragement from listeners, advertisers who stood strong beside us, and community leaders who helped us through this maze, that made this three-month period of time overflow with blessings! Engineer Gary Brown constantly checked the new foundation to make certain that the ground system was still making good electrical connection with the new tower base. Gary and Bart are friends who have worked together since the 1970’s. Gary is another one of those Good Neighbors. Special thanks to Fred Farrer (left photo) for taking a personal interest in this project and seeing that the foundation was completed quickly and with extreme strength. This community leader took a personal interest in the project, and showed his crews how the rebar and concrete needed to be placed to assure that the new tower had super strength. Geosciences Design Group, LLC (GDG) from Nashville did the earth core drillings. With the use of a sonic pulse meter GDG was able to test the strength of the four existing pillars. John Carpenter along with the GDG engineers designed the massive new foundation on which the 37,000 pound Pi ROD tower was constructed. In addition to the concrete/rebar foundation, the tower base is also anchored to the solid rock that is four-feet below the earth’s surface. This tower is definitely "built on a firm foundation". The massive solid steel PiROD tower is UP! Our special thanks to Rick Templeton with the City of Murfreesboro for keeping the water level DOWN at the tower site. Beavers were busy building dams, and the water-flow from Murfree Spring would begin to fill the wetlands. 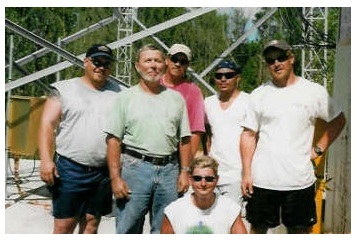 Rick’s crew opened the spillway twice weekly to keep the land dry so that tower construction could be completed. The massive foundation that was constructed by Farrer Brothers Excavating included over 100-yards of concrete, much rebar and then anchored it all to the solid rock that is found throughout the county. This gave a firm foundation to the 32-stories of solid steel towering over the ‘Boro! Farrer Construction completed the foundation on which the new WGNS tower was placed. Southern Broadcast Services, Jim Coleman’s Birmingham based tower construction firm, erected the massive 328-foot self-supporting tower! Jim’s crew really knew broadcast engineering. You couldn’t have found a more pleasant team of professionals to work with either. The new PiRod 328-foot self-supporting tower was manufactured and then shipped to Murfreesboro on a large tractor-trailer rig. Each section was laid-out and assembled on the "parking pad" in front of the WGNS’ transmitter building (see photo below). Once everything had arrived and was in place, it took only a week to wrap-up the job. 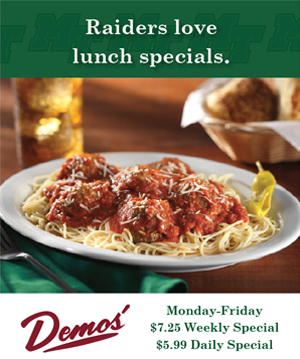 We refer to those as the SEVEN SENSATIONAL DAYS. As you know, water is a great conductor of electricity. 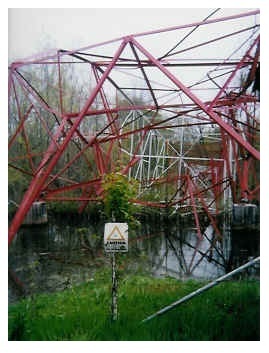 A broadcast tower that is surrounded by water makes the radio station’s signal go even farther. That is why the WGNS' tower was placed in the wetlands back in 1946. 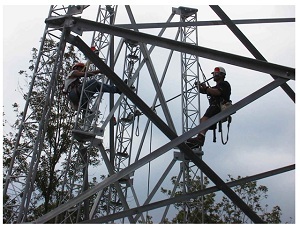 The crew put the first 175-feet of new tower together in 40-foot sections. They stood in various places around the parking lot. (see above photo). Bud Elliot’s smaller crane was replaced with a giant 300-ton unit. It had a 200-foot boom. This monster had six huge double-wheels on each side. Once in place, hydraulic lifts lowered leveling arms to secure the crane on the parking pad in front of WGNS’ small transmitter building. 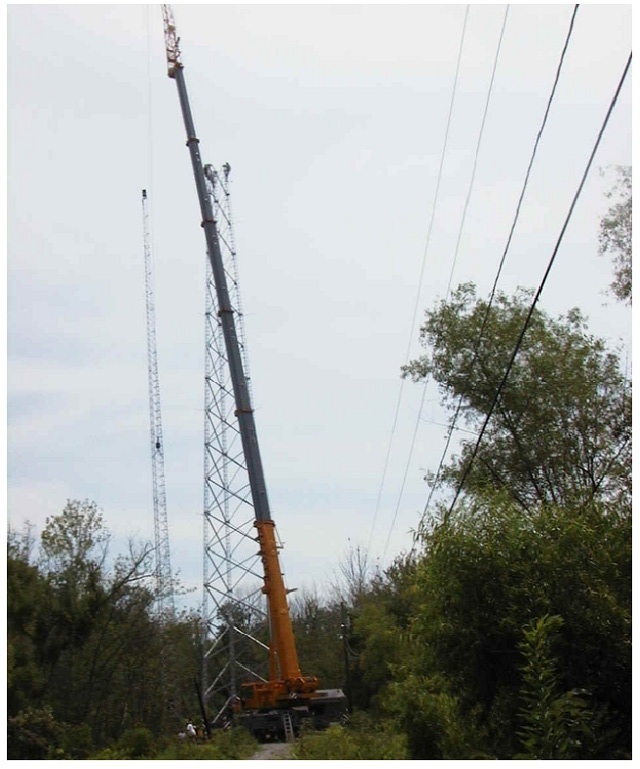 It was like a giant erector set, with crews dangling from cables and bolting sections of the structure together in smaller sections that were sitting on the ground around WGNS' transmitter building. Jim Coleman's crew made the massive job look easy and go like clockwork. The huge puzzle that arrived in Murfreesboro three-month earlier on the back of a trailer, was now almost together. While this was taking place, Engineer Watt Hairston was busy tweaking the electrical connections. It took a week to put all of the sections together. Once the "monster crane" arrived, it took only 4-hours to lift all of the sections into place. That was a sight to see. In fact, people all over the downtown area watched the Good Neighbor Station come back together again. Bud’s massive 300-ton crane lifted the final 153-foot section of PiRod tower into place. 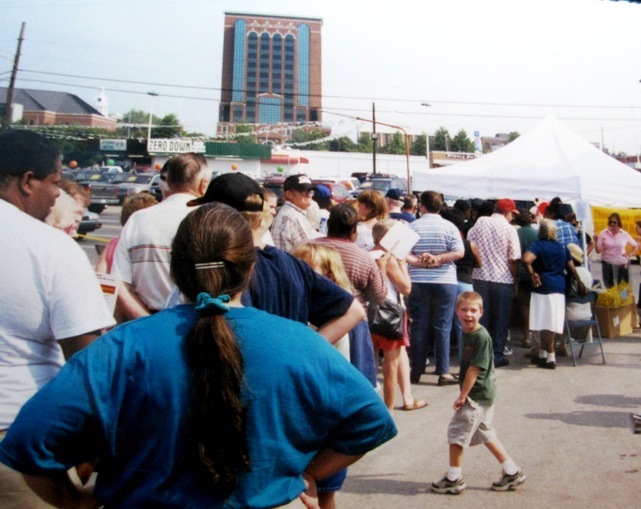 It was now Friday, July 13, 2001, and a few blocks away Uncle Dave Macon Days was attracting thousands of persons to Cannonsburgh. Lifting that final section of tower into place created more conversation than the show on the stage, especially when they could see a man in the tower section and being lifted into the air by the crane (see photo below). This team worked together and guided the top section into the locking guides of the lower 75-feet of wide-based tower. Once in place, this new tower became Murfreesboro’s tallest structure (over 32-stories)! Watt Hairston, WSM’s chief engineer, shouted praises about the Birmingham based tower construction firm. This team of caring professionals turned a catastrophic event into a blessing! And Watt was another good neighbor. He is a perfectionist! When the tower was up and connected, Watt fine-tuned the system for a perfect match between the tower and Nautel solid-state transmitter. This not only assured greater coverage for WGNS Talk Radio, it also has dramatically improved the audio quality. Tune to AM 1450 and see if you don’t agree. 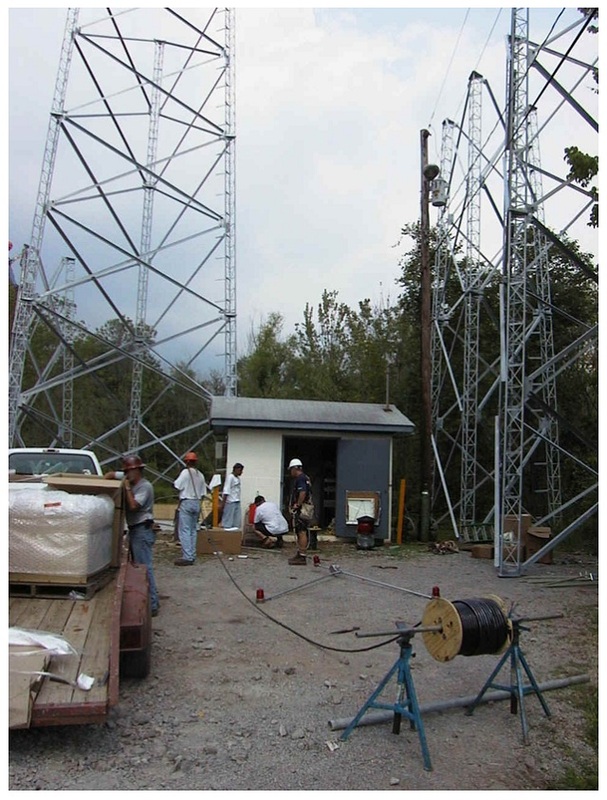 The fine-tuning of the new tower to our Nautel transmitter was completed on Saturday, July 14, 2001. At 3:00pm WGNS was back at full-coverage. The new Kintronic’s antenna greatly improved WGNS’ signal strength, loudness as well as clearness of sound. That means you’ll hear the "Good Neighbor Station" clearer, louder and farther away! Listeners phoned, sent e-mails and wrote with "reception reports" showing dramatic improvements from the old tower. This would not have been possible without the local advertisers who stayed on WGNS and gave encouragement during this trying period. By saying, we’ve been blessed, is really putting it mildly. The advertisers and our listeners all stood beside us. In fact, the number of listeners increased! Again–this created a sense of WGNS ownership by the listeners. As a result, we all celebrated together when the new tower was completed on July 14, 2001. That was the day before my birthday, and the friendships made with this experience were gifts that I will cherish all of my life. How tall is 328-feet (100 meters)? How tall is 328-feet? It is 32-stories of steel towering over Murfreesboro. That would be the equivalent of stacking two downtown Murfreesboro NHC City Centers on top of each other and then adding two more floors! It is even taller than Nashville’s tallest building (AT&T’s BAT building). Special thanks to Joe Sneed, owner of Joe’s Body Shop, for allowing the cranes, dump trucks, concrete trucks and other heavy equipment to travel through his business. Joe was inconvenienced over the 3-months of preparation and construction period. He always smiled and said, "That’s what neighbors are for." All of us at WGNS thank Joe Sneed. And like the Egyptian legend of the Phoenix bird that rises from its own ashes invigorated with a youthful freshness, your Good Neighbor Station is back with a reaffirmed and stronger commitment to better serve our community. THANK YOU! On Saturday, August 25, 2001, a steady flow of listeners gathered under the shadow of the new tower for a Community Tower Celebration Party. In the brief 2-hours between 10:00am and noon, more than a thousand listeners joined-together for fun and true fellowship. It was a hot Tennessee day, and WGNS gave out hand-fans with a cartoon of a giant cloud huffing and puffing, but not having any affect on the new super-strong tower. Left Photo: Woodrow Medlock, one of the first persons on WGNS back in 1947. He joined in on the celebration of the radio station being back at full coverage. Large safety-lid drinking glasses with similar illustrations were also handed-out to the crowd. Listeners attending the party shared their stories on-the-radio about how the tower being down impacted them. Believe it or not, the two big areas of enthusiasm were being able to clearly hear Swap’n Shop again each morning and going to the Braves Baseball games with the Good Neighbor Station. There was much conversation about how much louder, clearer and stronger the WGNS’ signal was now. At the beginning of this story, we identified this as a 3-month Parade of Blessings. Hearing the comments from the crowd of good neighbors was a true blessing! 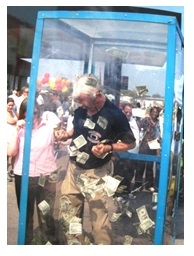 One of the popular attractions at the Tower Celebration was the Alexander Ford "money machine" (Photo left). Many WGNS’ listeners walked away with pockets full of cash. They kept the cash grabbed in the air within one-minute and forty-five seconds (get it…WGNS is 1450 on the dial). This is an example of how other local businesses jumped-in to help WGNS in our time of need. The Good Neighbor Station provided the instant cash, and listeners walked away with money in hand. 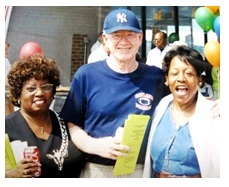 Don Alexander and his staff at Alexander Ford have been long-time WGNS friends. Their encouragement and support during the three-month rebuilding period helped us through what could have been dark days. Instead, they were challenges that gave new opportunities! In fact, all of our regular advertisers continued with WGNS during this three-month period. And when we needed support at the city’s zoning appeals board meeting, it was announced on the radio and there was standing room only in the council chambers. Listeners greatly increased during this challenged time. And the audience size has continued to explode in the years following the challenges brought-on Easter Sunday, 2001. Church of Christ preacher and long-time WGNS supporter Leamon Flatt started the Tower Celebration with a prayer. (right photo) Leamon Flatt and community leader and educator Myrtle Lord talk with each other at the WGNS Celebration. That was not the only time prayers were given for the new tower. The day after the job was finished, Rev. Eric Laverentz, Associate Minister of First Presbyterian Church, gave a private blessing of the tower. He asked that it be used to open new lines of communications between people in this community, help citizens to work harmoniously toward the same goals and serve as a voice of encouragement when life gets rough. Later, State Representative John Hood joined the "live" broadcast. Special thanks to everyone at the Bi Lo Grocery on Memorial Boulevard for giving away ice cream, soft drinks, water as well as a DVD player and color TV that were won by lucky WGNS' listeners. In fact, as you looked around the celebration, you saw large numbers of people described as the who’s who of Murfreesboro and Rutherford County. (L-R) Mary Glass, Jack Welchance and Jean Vaughn join their friends to celebrate WGNS going back to full power with its new tower. Fun, Games, Prizes and Food! A "Moonwalk Clown-house" from Stewart’s Party Rentals was a popular site for the younger set. Special "thanks" to McDonald’s on Broad for allowing us to have this event in the vacant lot adjacent to their restaurant and beside the new 328-foot WGNS' tower. 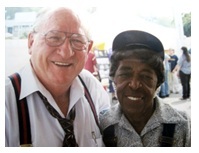 (L-R above photo) Myrtle Glanton Lord talks with banker Bill Rowland. 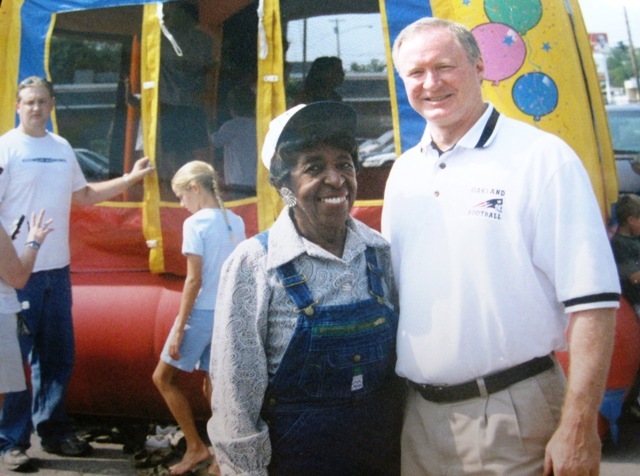 In the background, (far left) WGNS' Scott Walker is helping youngsters into the Moonwalk inflatable. WGNS’ listeners represent a wide span of ages. One thing all of our Talk Radio listeners have in common is that "they are involved in the community". They are the "movers and shakers" in each of their demographic groups. It was the strong outpouring of both local residents and community leaders that allowed the voice of the Good Neighbor Station to come back to the Heart of Tennessee even stronger than ever before! Bart's wife, Lee Ann Walker, was there at the listener party helping with daughter Kristin and daughter-in-law Angie. Lee Ann is in charge of promotions and designed the artwork that was displayed on the fans and glasses. 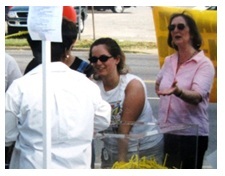 Left photo: Bart's daughter Kristin (white sleeveless shirt) and his wife Lee Ann (pink shirt) give gifts to the listeners who attended the celebration party. Now, the thousands of visitors who walk through the Murfree Spring wetlands, can hear about WGNS' sound history by pushing the red button on the graphic box attached to the front wall of the transmitter building. You’ll hear John Hood live from Sewart Air Force Base, Bill Barry doing a big band radio show on WGNS in the late 40s, part of a war time newscast, and Bart Walker anchoring special emergency coverage of the tornado that destroyed hundreds of Murfreesboro homes in January, 1991. WGNS works to be a mirror of what happens in our community. On March 1, 2007, WGNS added FM 100.5 and FM 101.9. The Federal Communications Commission gave special authority to WGNS that allowed the AM radio station to rebroadcast its programs over FM translators. This is something Bart Walker worked on for almost a decade. WGNS was the first AM station in the nation to come on-the-air with this special FM translator service. The day after WGNS began, a station in Rock Hill, S.C. became the second AM broadcaster. The Good Neighbor Network is now found on the FM band, AM, over-the-air TV 11 and worldwide on the internet at www.WGNSradio.com. Plus, another bonus of the website, listeners are able to interact on news stories and community events. 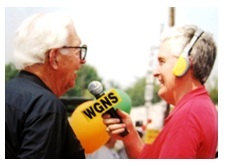 WGNS has been first in many areas of service. WGNS was Rutherford County’s first radio station (1947). It was the first station to go C-Quam AM stereo in November, 1984. 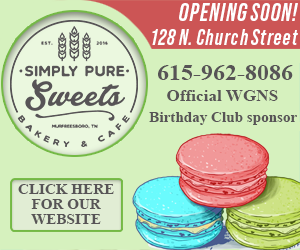 WGNS continues to use the latest technology to better serve the Heart of Tennessee with a never ending series of FIRSTS! Middle Tennessee Two-Way’s owner John Hettish gets a bird’s eye view from atop WGNS’ 328-foot tower that overlooks Murfreesboro, Tennessee. John’s firm does an excellent job of keeping the day and night strobes working properly on the tallest structure in Murfreesboro. They also do antenna maintenance and tower inspection to keep the WGNS’ signal at its peak. 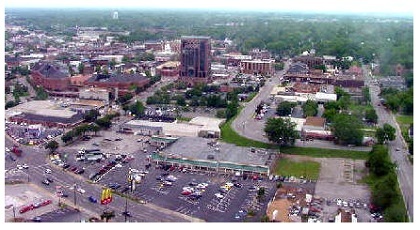 John took this picture (left photo) of downtown Murfreesboro from atop the new tower. It gives an interesting perspective of the historic business district. Since WGNS came-on-the-air in 1947, our tower is only about four blocks from the town square. Murfreesboro actually grew-up around the WGNS’ tower. This helps us to equally spread a strong signal over one of the top 25 fastest growing cities in the nation. 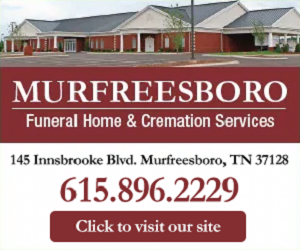 Murfreesboro's population is now over 110,000 persons, and Rutherford County has exploded past a quarter of a million residents. The boardwalk through the wetlands lets the public walk beside the tall tower that many say is a landmark that helps them find their way in Murfreesboro. The white line you see in this photo is the actual boardwalk. It is elevated about 4-feet above the wetlands. You can see a reddish line on each side of the boardwalk. That is the metal railings that keep visitors from falling into the water. As you walk along this elevated path, you watch beavers, ducks, turtles, geese and all types of wildlife. Mosquitoes were a major problem until the Murfreesboro Parks and Recreation Department installed giant bat houses throughout the area. The bats do a great job of eating the mosquitoes. 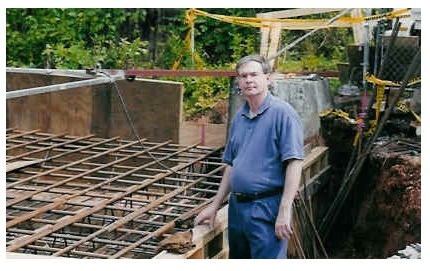 John Hettish (right photo) not only maintains the WGNS’ tower, he also played a vital part in the construction of the new self-supporting structure. John and his staff at Middle Tennessee Two-Way look for ways to help others. He too is a Good Neighbor! John is a true professional and a local good neighbor who is always there whenever help is needed. His firms maintains WGNS' tower, keeps the lighting system working properly and performs routine maintenance and improvements on the 328-foot (100 meter) structure that is located in the center of downtown Murfreesboro. The WGNS' tower site looks quite a bit different these days. The massive new 328-foot self-supporting PiRod tower is built on a solid foundation that is bordered with an 8-foot fence. A 3-foot section of barbed-wire is on top of that, bringing the fence height to 11-feet. The green WGNS’ transmitter building is colored to complement the beauty of the surrounding nature. And the strobe lights are used on the tower, so that it will not have to be painted red and white. The galvanized steel better blends into the color of the sky. Everything was thought out in detail before the new tower was constructed. The boardwalk extends to the Discovery Center at Murfree Spring. Forecasts call for 75,000 persons to pass by the Good Neighbor tower each year. The public is encouraged to enjoy the boardwalk system for no admission fee. 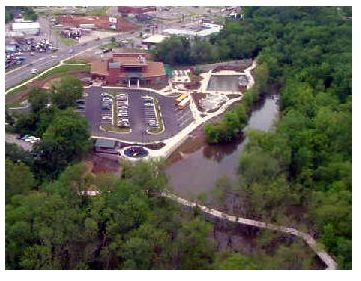 Park at the Discovery Center at Murfree Spring (502 S.E. Broad Street at Maney Avenue) and enjoy nature. And along the water pools outside the Discovery Center at Murfree Spring, you will find a 150-foot Murfreesboro History Wall. Sculptured art on this wall gives a timeline of Murfreesboro’s history. Toward the far right of the wall, the story of Rutherford County’s first radio station is shown. Remember, WGNS is your radio station. When you hear something you like, let us know. And even more important, when you hear something you don't like--especially let us know!